Ever have a student (or 5) who line up at the door and are all over the other kids, in their space, and bothering everyone? Have a student (or 5) who are constantly fighting about where to sit at the table? These are challenges we face in general and special education. It's prevalent in younger grades, but some of our students still struggle with this at older ages. I may have a solution....paper...taped....on....the...floor / table / chair. Every time I suggest this and put it in place in a classroom, I feel like such a fraud. A teacher asks for ideas about how to handle this challenging behavior and I suggest that we tape paper on the floor. But I have to tell you, it works almost every time. Will there be a student who it isn't effective for? Sure. However, if the problem involves more than 1 student, chances are this is a good solution for a number of them. When I forget to put these cues in place for the kids i work with who have autism, I remember it really quickly when they are all over each other while lining up. 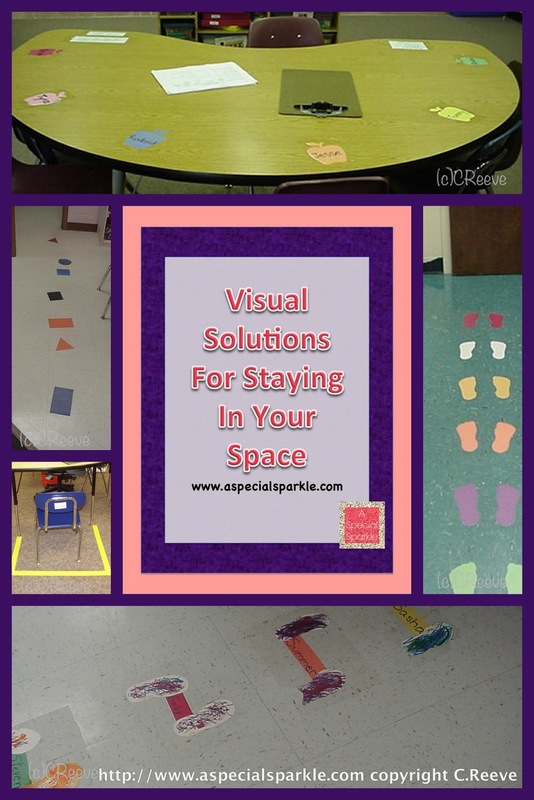 So, I thought I would share some examples of how these types of visual cues can be used to prevent behaviors when you set up your classroom (like I know you are thinking about, even thought it's summer!). One of the easiest strategies to use is putting feet on the floor. This works great for younger classes and resource classes. 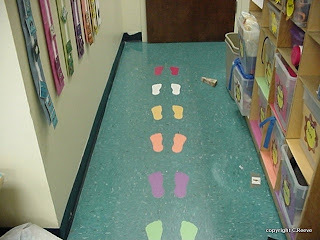 In this example, we used clear packing tape to tape the feet to the floor. 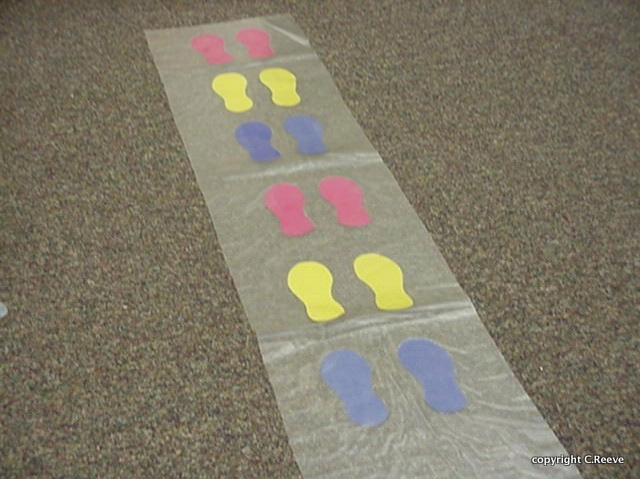 We used colored feet so that if we needed to, we could tell students who didn't need to stand next to each other) to stand on colors at different places. Two pieces of advice when doing this. First, tape the feet on the floor with the door open or you (read, I) end up taping them too close to the door and it hits the line leader. Second, use Scotch packing tape. In this case, the brand name is actually better--it's more durable. 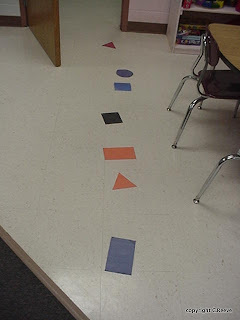 In this example, we weren't allowed to put tape on the floor. It was a brand new building. So, we took 2 strips of contact paper, put the feet between them, and sealed them up. Word to the wise, put hard Velcro strips on the bottom so it grabs the carpet and keeps it from slipping when people stand on it. One of the great things about this one was that we could take it with us to specials and other activities in the school and use it to line up in other places. We just rolled it out at the door. On the left, the students line up with a buddy and they walk 2 by 2 down the hall. On the right, we used shapes rather than feet because the students were older. I have also used numbers and just plain squares or rectangles. You can also put names on them for a little more direction. In addition to lining up, visuals are great for telling students where to sit. 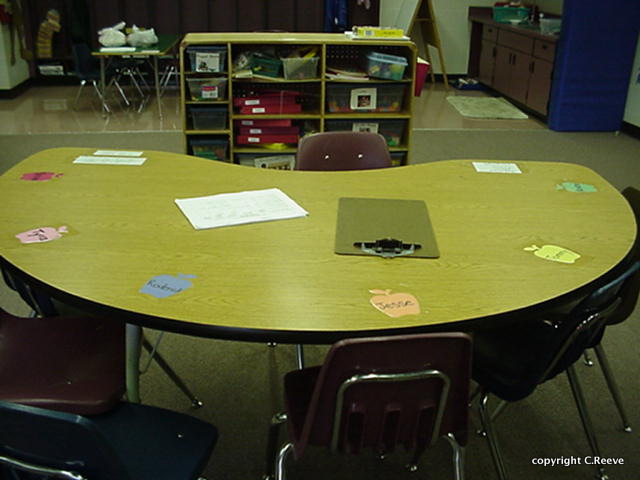 In this example, every student has a shape at the table that tells him or her where to sit at the table. The shape has his or her name on it and the color typically coordinates with his schedule color in a resource classroom. On this table, we used packing tape again to put them down. We have found this to be more durable than Velcro but it really depends on your situation. This is also a great strategy to use for younger students during carpet time; put a visual down where he needs to sit. If he can stay on the carpet square or other marker with just the visual, it reduces the adult support he needs. If you have a student who is included in a general education classroom, or as students get older, just write his or her name on tape and put it on the desk or place at the table. For instance, if he goes into science, his place at the lab table could have his name on it. You could velcro it as well. And finally, some students need more visual structure. This guy would sit in his chair at the table, but over time he would move his chair farther and farther away from the activity. 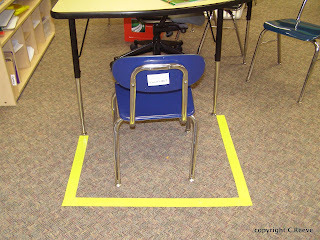 To help him stay in one place without continual reminders, the teacher put duct tape on the floor surrounding his chair. Over time we faded the tape by picking up pieces of it at a time. I've done the same thing with a student who kept moving away during calendar time. We put the tape on the floor and the difference in his behavior was unbelievable. Suddenly he wouldn't let his chair stray out of the box! Which meant he was sitting right where he should be. So, those are just a few examples of how visual supports can be used to help students know where to be in the classroom. As I said, it never ceases to amaze me how well it works. And if you think about it, it's not that different than the sign at the DMV that tells us "Wait here for the next clerk." And if you have gone through airport security recently, there are feet on the floor that tell you where to wait and where to stand when you go through the scanner or when you wait for the results. Unfortunately they won't let me take pictures there! So, how have you used visual supports to help students know where to stand and sit? Share in the comments as everyone can always use more new ideas!